there would be a nationwide marketing campaign urging doctors to use it. The damage that the human body can survive these days is as awesome as it is horrible: crushing, burning, bombing, a burst blood vessel in the brain, a ruptured colon, a massive heart attack, rampaging infection. These conditions had once been uniformly fatal. Now survival is commonplace, and a large part of the credit goes to the irreplaceable component of medicine known as intensive care. It’s an opaque term. Specialists in the field prefer to call what they do “critical care,” but that doesn’t exactly clarify matters. The non-medical term “life support” gets us closer. Intensive-care units take artificial control of failing bodies. Typically, this involves a panoply of technology—a mechanical ventilator and perhaps a tracheostomy tube if the lungs have failed, an aortic balloon pump if the heart has given out, a dialysis machine if the kidneys don’t work. When you are unconscious and can’t eat, silicone tubing can be surgically inserted into the stomach or intestines for formula feeding. If the intestines are too damaged, solutions of amino acids, fatty acids, and glucose can be infused directly into the bloodstream. The difficulties of life support are considerable. Reviving a drowning victim, for example, is rarely as easy as it looks on television, where a few chest compressions and some mouth-to-mouth resuscitation always seem to bring someone with waterlogged lungs and a stilled heart coughing and sputtering back to life. Consider a case report in The Annals of Thoracic Surgery of a three-year-old girl who fell into an icy fishpond in a small Austrian town in the Alps. She was lost beneath the surface for thirty minutes before her parents found her on the pond bottom and pulled her up. Following instructions from an emergency physician on the phone, they began cardiopulmonary resuscitation. A rescue team arrived eight minutes later. The girl had a body temperature of sixty-six degrees, and no pulse. Her pupils were dilated and did not react to light, indicating that her brain was no longer working. What makes her recovery astounding isn’t just the idea that someone could come back from two hours in a state that would once have been considered death. It’s also the idea that a group of people in an ordinary hospital could do something so enormously complex. To save this one child, scores of people had to carry out thousands of steps correctly: placing the heart-pump tubing into her without letting in air bubbles; maintaining the sterility of her lines, her open chest, the burr hole in her skull; keeping a temperamental battery of machines up and running. The degree of difficulty in any one of these steps is substantial. Then you must add the difficulties of orchestrating them in the right sequence, with nothing dropped, leaving some room for improvisation, but not too much. For every drowned and pulseless child rescued by intensive care, there are many more who don’t make it—and not just because their bodies are too far gone. Machines break down; a team can’t get moving fast enough; a simple step is forgotten. Such cases don’t get written up in The Annals of Thoracic Surgery, but they are the norm. 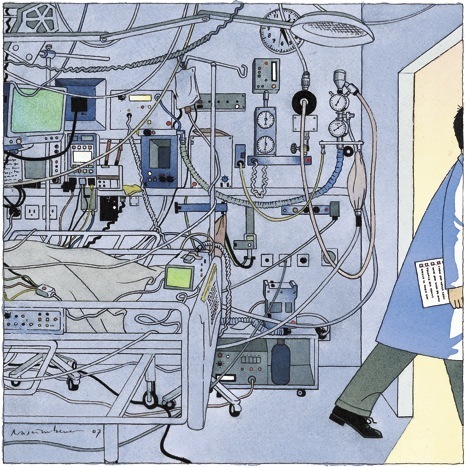 Intensive-care medicine has become the art of managing extreme complexity—and a test of whether such complexity can, in fact, be humanly mastered. On any given day in the United States, some ninety thousand people are in intensive care. Over a year, an estimated five million Americans will be, and over a normal lifetime nearly all of us will come to know the glassed bay of an I.C.U. from the inside. Wide swaths of medicine now depend on the lifesupport systems that I.C.U.s provide: care for premature infants; victims of trauma, strokes, and heart attacks; patients who have had surgery on their brain, heart, lungs, or major blood vessels. Critical care has become an increasingly large portion of what hospitals do. Fifty years ago, I.C.U.s barely existed. Today, in my hospital, a hundred and fifty-five of our almost seven hundred patients are, as I write this, in intensive care. The average stay of an I.C.U. patient is four days, and the survival rate is eighty-six per cent. Going into an I.C.U., being put on a mechanical ventilator, having tubes and wires run into and out of you, is not a sentence of death. But the days will be the most precarious of your life. A decade ago, Israeli scientists published a study in which engineers observed patient care in I.C.U.s for twenty-four-hour stretches. They found that the average patient required a hundred and seventy-eight individual actions per day, ranging from administering a drug to suctioning the lungs, and every one of them posed risks. Remarkably, the nurses and doctors were observed to make an error in just one per cent of these actions—but that still amounted to an average of two errors a day with every patient. Intensive care succeeds only when we hold the odds of doing harm low enough for the odds of doing good to prevail. This is hard. There are dangers simply in lying unconscious in bed for a few days. Muscles atrophy. Bones lose mass. Pressure ulcers form. Veins begin to clot off. You have to stretch and exercise patients’ flaccid limbs daily to avoid contractures, give subcutaneous injections of blood thinners at least twice a day, turn patients in bed every few hours, bathe them and change their sheets without knocking out a tube or a line, brush their teeth twice a day to avoid pneumonia from bacterial buildup in their mouths. Add a ventilator, dialysis, and open wounds to care for, and the difficulties only accumulate. The story of one of my patients makes the point. Anthony DeFilippo was a forty-eight-year-old limousine driver from Everett, Massachusetts, who started to hemorrhage at a community hospital during surgery for a hernia and gallstones. The bleeding was finally stopped but his liver was severely damaged, and over the next few days he became too sick for the hospital’s facilities. When he arrived in our I.C.U., at 1:30 A.M. on a Sunday, his ragged black hair was plastered to his sweaty forehead, his body was shaking, and his heart was racing at a hundred and fourteen beats a minute. He was delirious from fever, shock, and low oxygen levels. “I need to get out!” he cried. “I need to get out!” He clawed at his gown, his oxygen mask, the dressings covering his abdominal wound. He shoved her—he was a big man—and tried to swing his legs out of the bed. We turned up his oxygen flow, put his wrists in cloth restraints, and tried to reason with him. He eventually let us draw blood from him and give him antibiotics. The laboratory results came back showing liver failure, and a wildly elevated white-blood-cell count indicating infection. It soon became evident from his empty urine bag that his kidneys had failed, too. In the next few hours, his blood pressure fell, his breathing worsened, and he drifted from agitation to near-unconsciousness. Each of his organ systems, including his brain, was shutting down. I called his sister, who was his next of kin, and told her of the situation. “Do everything you can,” she said. So we did. We gave him a syringeful of anesthetic, and a resident slid a breathing tube into his throat. Another resident “lined him up.” She inserted a thin, two-inch-long needle and catheter through his upturned right wrist and into his radial artery, and then sewed the line to his skin with a silk suture. Next, she put in a central line—a twelve-inch catheter pushed into the jugular vein in his left neck. After she sewed that in place, and an X-ray showed its tip floating just where it was supposed to—inside his vena cava at the entrance to his heart—she put a third, slightly thicker line, for dialysis, through his right upper chest and into the subclavian vein, deep under the collarbone. We hooked a breathing tube up to a hose from a ventilator and set it to give him fourteen forced breaths of a hundred-per-cent oxygen every minute. We dialled the ventilator pressures and gas flow up and down, like engineers at a control panel, until we got the blood levels of oxygen and carbon dioxide where we wanted them. The arterial line gave us continuous arterial blood-pressure measurements, and we tweaked his medications to get the pressures we liked. We regulated his intravenous fluids according to venous-pressure measurements from his jugular line. We plugged his subclavian line into tubing from a dialysis machine, and every few minutes his entire blood volume washed through this artificial kidney and back into his body; a little adjustment here and there, and we could alter the levels of potassium and bicarbonate and salt in his body as well. He was, we liked to imagine, a simple machine in our hands. But he wasn’t, of course. It was as if we had gained a steering wheel and a few gauges and controls, but on a runaway eighteen-wheeler hurtling down a mountain. Keeping his blood pressure normal was requiring gallons of intravenous fluid and a pharmacy shelf of drugs. He was on near-maximal ventilator support. His temperature climbed to a hundred and four degrees. Less than five per cent of patients with his degree of organ failure make it home. And a single misstep could easily erase those slender chances. For ten days, though, all went well. His chief problem had been liver damage from the operation he’d had. The main duct from his liver was severed and was leaking bile, which is caustic—it digests the fat in one’s diet and was essentially eating him alive from the inside. He had become too sick to survive an operation to repair the leak. So we tried a temporary solution—we had radiologists place a plastic drain, using X-ray guidance, through his abdominal wall and into the severed duct in order to draw the leaking bile out of him. They found so much that they had to place three drains—one inside the duct and two around it. But, as the bile drained out, his fevers subsided. His requirements for oxygen and fluids diminished. His blood pressure returned to normal. He was on the mend. Then, on the eleventh day, just as we were getting ready to take him off the mechanical ventilator, he developed high, spiking fevers, his blood pressure sank, and his blood-oxygen levels plummeted again. His skin became clammy. He got shaking chills. We didn’t understand what had happened. He seemed to have developed an infection, but our X-rays and CT scans failed to turn up a source. Even after we put him on four antibiotics, he continued to spike fevers. During one fever, his heart went into fibrillation. A Code Blue was called. A dozen nurses and doctors raced to his bedside, slapped electric paddles onto his chest, and shocked him. His heart responded, fortunately, and went back into rhythm. It took two more days for us to figure out what had gone wrong. We considered the possibility that one of his lines had become infected, so we put in new lines and sent the old ones to the lab for culturing. Forty-eight hours later, the results returned: all of them were infected. The infection had probably started in one line, perhaps contaminated during insertion, and spread through his bloodstream to the others. Then they all began spilling bacteria into him, producing his fevers and steep decline. This is the reality of intensive care: at any point, we are as apt to harm as we are to heal. Line infections are so common that they are considered a routine complication. I.C.U.s put five million lines into patients each year, and national statistics show that, after ten days, four per cent of those lines become infected. Line infections occur in eighty thousand people a year in the United States, and are fatal between five and twenty-eight per cent of the time, depending on how sick one is at the start. Those who survive line infections spend on average a week longer in intensive care. And this is just one of many risks. After ten days with a urinary catheter, four per cent of American I.C.U. patients develop a bladder infection. After ten days on a ventilator, six per cent develop bacterial pneumonia, resulting in death forty to fifty-five per cent of the time. All in all, about half of I.C.U. patients end up experiencing a serious complication, and, once a complication occurs, the chances of survival drop sharply. It was a week before DeFilippo recovered sufficiently from his infections to come off the ventilator, and it was two months before he left the hospital. Weak and debilitated, he lost his limousine business and his home, and he had to move in with his sister. The tube draining bile still dangled from his abdomen; when he was stronger, I was going to have to do surgery to reconstruct the main bile duct from his liver. But he survived. Most people in his situation do not. Here, then, is the puzzle of I.C.U. care: you have a desperately sick patient, and in order to have a chance of saving him you have to make sure that a hundred and seventy-eight daily tasks are done right—despite some monitor’s alarm going off for God knows what reason, despite the patient in the next bed crashing, despite a nurse poking his head around the curtain to ask whether someone could help “get this lady’s chest open.” So how do you actually manage all this complexity? The solution that the medical profession has favored is specialization. I tell DeFilippo’s story, for instance, as if I were the one tending to him hour by hour. But that was actually Max Weinmann, an intensivist (as intensive-care specialists like to be called). I want to think that, as a general surgeon, I can handle most clinical situations. But, as the intricacies involved in intensive care have mounted, responsibility has increasingly shifted to super-specialists like him. In the past decade, training programs focussed on critical care have opened in every major American city, and half of I.C.U.s now rely on super-specialists. Expertise is the mantra of modern medicine. In the early twentieth century, you needed only a high-school diploma and a one-year medical degree to practice medicine. By the century’s end, all doctors had to have a college degree, a four-year medical degree, and an additional three to seven years of residency training in an individual field of practice—pediatrics, surgery, neurology, or the like. Already, though, this level of preparation has seemed inadequate to the new complexity of medicine. After their residencies, most young doctors today are going on to do fellowships, adding one to three further years of training in, say, laparoscopic surgery, or pediatric metabolic disorders, or breast radiology—or critical care. A young doctor is not so young nowadays; you typically don’t start in independent practice until your mid-thirties. We now live in the era of the super-specialist—of clinicians who have taken the time to practice at one narrow thing until they can do it better than anyone who hasn’t. Super-specialists have two advantages over ordinary specialists: greater knowledge of the details that matter and an ability to handle the complexities of the job. There are degrees of complexity, though, and intensive-care medicine has grown so far beyond ordinary complexity that avoiding daily mistakes is proving impossible even for our super-specialists. The I.C.U., with its spectacular successes and frequent failures, therefore poses a distinctive challenge: what do you do when expertise is not enough? On October 30, 1935, at Wright Air Field in Dayton, Ohio, the U.S. Army Air Corps held a flight competition for airplane manufacturers vying to build its next-generation long-range bomber. It wasn’t supposed to be much of a competition. In early evaluations, the Boeing Corporation’s gleaming aluminum-alloy Model 299 had trounced the designs of Martin and Douglas. Boeing’s plane could carry five times as many bombs as the Army had requested; it could fly faster than previous bombers, and almost twice as far. A Seattle newspaperman who had glimpsed the plane called it the “flying fortress,” and the name stuck. The flight “competition,” according to the military historian Phillip Meilinger, was regarded as a mere formality. The Army planned to order at least sixty-five of the aircraft. They could have required Model 299 pilots to undergo more training. But it was hard to imagine having more experience and expertise than Major Hill, who had been the U.S. Army Air Corps’ chief of flight testing. Instead, they came up with an ingeniously simple approach: they created a pilot’s checklist, with step-by-step checks for takeoff, flight, landing, and taxiing. Its mere existence indicated how far aeronautics had advanced. In the early years of flight, getting an aircraft into the air might have been nerve-racking, but it was hardly complex. Using a checklist for takeoff would no more have occurred to a pilot than to a driver backing a car out of the garage. But this new plane was too complicated to be left to the memory of any pilot, however expert. Pronovost is hardly the first person in medicine to use a checklist. But he is among the first to recognize its power to save lives and take advantage of the breadth of its possibilities. Forty-two years old, with cropped light-brown hair, tenth-grader looks, and a fluttering, finchlike energy, he is an odd mixture of the nerdy and the messianic. He grew up in Waterbury, Connecticut, the son of an elementary-school teacher and a math professor, went to nearby Fairfield University, and, like many good students, decided that he would go into medicine. Unlike many students, though, he found that he actually liked caring for sick people. He hated the laboratory—with all those micropipettes and cell cultures, and no patients around—but he had that scientific “How can I solve this unsolved problem?” turn of mind. So after his residency in anesthesiology and his fellowship in critical care, he studied clinical-research methods. For his doctoral thesis, he examined intensive-care units in Maryland, and he discovered that putting an intensivist on staff reduced death rates by a third. It was the first time that someone had demonstrated the public-health value of using intensivists. He wasn’t satisfied with having proved his case, though; he wanted hospitals to change accordingly. After his study was published, in 1999, he met with a coalition of large employers known as the Leapfrog Group. It included companies like General Motors and Verizon, which were seeking to improve the standards of hospitals where their employees obtain care. Within weeks, the coalition announced that its members expected the hospitals they contracted with to staff their I.C.U.s with intensivists. These employers pay for health care for thirty-seven million employees, retirees, and dependents nationwide. So although hospitals protested that there weren’t enough intensivists to go around, and that the cost could be prohibitive, Pronovost’s idea effectively became an instant national standard. After the checklist results, the idea Pronovost truly believed in was that checklists could save enormous numbers of lives. He took his findings on the road, showing his checklists to doctors, nurses, insurers, employers—anyone who would listen. He spoke in an average of seven cities a month while continuing to work full time in Johns Hopkins’s I.C.U.s. But this time he found few takers. In 2003, however, the Michigan Health and Hospital Association asked Pronovost to try out three of his checklists in Michigan’s I.C.U.s. It would be a huge undertaking. Not only would he have to get the state’s hospitals to use the checklists; he would also have to measure whether doing so made a genuine difference. But at last Pronovost had a chance to establish whether his checklist idea really worked. This past summer, I visited Sinai-Grace Hospital, in inner-city Detroit, and saw what Pronovost was up against. Occupying a campus of red brick buildings amid abandoned houses, check-cashing stores, and wig shops on the city’s West Side, just south of 8 Mile Road, Sinai-Grace is a classic urban hospital. It has eight hundred physicians, seven hundred nurses, and two thousand other medical personnel to care for a population with the lowest median income of any city in the country. More than a quarter of a million residents are uninsured; three hundred thousand are on state assistance. That has meant chronic financial problems. Sinai-Grace is not the most cash-strapped hospital in the city—that would be Detroit Receiving Hospital, where a fifth of the patients have no means of payment. But between 2000 and 2003 Sinai-Grace and eight other Detroit hospitals were forced to cut a third of their staff, and the state had to come forward with a fifty-million-dollar bailout to avert their bankruptcy. Sinai-Grace has five I.C.U.s for adult patients and one for infants. Hassan Makki, the director of intensive care, told me what it was like there in 2004, when Pronovost and the hospital association started a series of mailings and conference calls with hospitals to introduce checklists for central lines and ventilator patients. “Morale was low,” he said. “We had lost lots of staff, and the nurses who remained weren’t sure if they were staying.” Many doctors were thinking about leaving, too. Meanwhile, the teams faced an even heavier workload because of new rules limiting how long the residents could work at a stretch. Now Pronovost was telling them to find the time to fill out some daily checklists? I accompanied a team on 7 A.M. rounds through one of the surgical I.C.U.s. It had eleven patients. Four had gunshot wounds (one had been shot in the chest; one had been shot through the bowel, kidney, and liver; two had been shot through the neck, and left quadriplegic). Five patients had cerebral hemorrhaging (three were seventy-nine years and older and had been injured falling down stairs; one was a middle-aged man whose skull and left temporal lobe had been damaged by an assault with a blunt weapon; and one was a worker who had become paralyzed from the neck down after falling twenty-five feet off a ladder onto his head). There was a cancer patient recovering from surgery to remove part of his lung, and a patient who had had surgery to repair a cerebral aneurysm. The doctors and nurses on rounds tried to proceed methodically from one room to the next but were constantly interrupted: a patient they thought they’d stabilized began hemorrhaging again; another who had been taken off the ventilator developed trouble breathing and had to be put back on the machine. It was hard to imagine that they could get their heads far enough above the daily tide of disasters to worry about the minutiae on some checklist. Yet there they were, I discovered, filling out those pages. Mostly, it was the nurses who kept things in order. Each morning, a senior nurse walked through the unit, clipboard in hand, making sure that every patient on a ventilator had the bed propped at the right angle, and had been given the right medicines and the right tests. Whenever doctors put in a central line, a nurse made sure that the central-line checklist had been filled out and placed in the patient’s chart. Looking back through their files, I found that they had been doing this faithfully for more than three years. Pronovost had been canny when he started. In his first conversations with hospital administrators, he didn’t order them to use the checklists. Instead, he asked them simply to gather data on their own infection rates. In early 2004, they found, the infection rates for I.C.U. patients in Michigan hospitals were higher than the national average, and in some hospitals dramatically so. Sinai-Grace experienced more line infections than seventy-five per cent of American hospitals. Meanwhile, Blue Cross Blue Shield of Michigan agreed to give hospitals small bonus payments for participating in Pronovost’s program. A checklist suddenly seemed an easy and logical thing to try. In what became known as the Keystone Initiative, each hospital assigned a project manager to roll out the checklists and participate in a twice-monthly conference call with Pronovost for trouble-shooting. Pronovost also insisted that each participating hospital assign to each unit a senior hospital executive, who would visit the unit at least once a month, hear people’s complaints, and help them solve problems. The executives were reluctant. They normally lived in meetings worrying about strategy and budgets. They weren’t used to venturing into patient territory and didn’t feel that they belonged there. In some places, they encountered hostility. But their involvement proved crucial. In the first month, according to Christine Goeschel, at the time the Keystone Initiative’s director, the executives discovered that the chlorhexidine soap, shown to reduce line infections, was available in fewer than a third of the I.C.U.s. This was a problem only an executive could solve. Within weeks, every I.C.U. in Michigan had a supply of the soap. Teams also complained to the hospital officials that the checklist required that patients be fully covered with a sterile drape when lines were being put in, but full-size barrier drapes were often unavailable. So the officials made sure that the drapes were stocked. Then they persuaded Arrow International, one of the largest manufacturers of central lines, to produce a new central-line kit that had both the drape and chlorhexidine in it. In December, 2006, the Keystone Initiative published its findings in a landmark article in The New England Journal of Medicine. Within the first three months of the project, the infection rate in Michigan’s I.C.U.s decreased by sixty-six per cent. The typical I.C.U.—including the ones at Sinai-Grace Hospital—cut its quarterly infection rate to zero. Michigan’s infection rates fell so low that its average I.C.U. outperformed ninety per cent of I.C.U.s nationwide. In the Keystone Initiative’s first eighteen months, the hospitals saved an estimated hundred and seventy-five million dollars in costs and more than fifteen hundred lives. The successes have been sustained for almost four years—all because of a stupid little checklist. Pronovost’s results have not been ignored. He has since had requests to help Rhode Island, New Jersey, and the country of Spain do what Michigan did. Back in the Wolverine State, he and the Keystone Initiative have begun testing half a dozen additional checklists to improve care for I.C.U. patients. He has also been asked to develop a program for surgery patients. It has all become more than he and his small group of researchers can keep up with. But consider: there are hundreds, perhaps thousands, of things doctors do that are at least as dangerous and prone to human failure as putting central lines into I.C.U. patients. It’s true of cardiac care, stroke treatment, H.I.V. treatment, and surgery of all kinds. It’s also true of diagnosis, whether one is trying to identify cancer or infection or a heart attack. All have steps that are worth putting on a checklist and testing in routine care. The question—still unanswered—is whether medical culture will embrace the opportunity. Tom Wolfe’s “The Right Stuff” tells the story of our first astronauts, and charts the demise of the maverick, Chuck Yeager test-pilot culture of the nineteen-fifties. It was a culture defined by how unbelievably dangerous the job was. Test pilots strapped themselves into machines of barely controlled power and complexity, and a quarter of them were killed on the job. The pilots had to have focus, daring, wits, and an ability to improvise—the right stuff. But as knowledge of how to control the risks of flying accumulated—as checklists and flight simulators became more prevalent and sophisticated—the danger diminished, values of safety and conscientiousness prevailed, and the rock-star status of the test pilots was gone. The still limited response to Pronovost’s work may be easy to explain, but it is hard to justify. If someone found a new drug that could wipe out infections with anything remotely like the effectiveness of Pronovost’s lists, there would be television ads with Robert Jarvik extolling its virtues, detail men offering free lunches to get doctors to make it part of their practice, government programs to research it, and competitors jumping in to make a newer, better version. That’s what happened when manufacturers marketed central-line catheters coated with silver or other antimicrobials; they cost a third more, and reduced infections only slightly—and hospitals have spent tens of millions of dollars on them. But, with the checklist, what we have is Peter Pronovost trying to see if maybe, in the next year or two, hospitals in Rhode Island and New Jersey will give his idea a try. Pronovost remains, in a way, an odd bird in medical research. He does not have the multimillion-dollar grants that his colleagues in bench science have. He has no swarm of doctoral students and lab animals. He’s focussed on work that is not normally considered a significant contribution in academic medicine. As a result, few other researchers are venturing to extend his achievements. Yet his work has already saved more lives than that of any laboratory scientist in the past decade. I called Pronovost recently at Johns Hopkins, where he was on duty in an I.C.U. I asked him how long it would be before the average doctor or nurse is as apt to have a checklist in hand as a stethoscope (which, unlike checklists, has never been proved to make a difference to patient care). “At the current rate, it will never happen,” he said, as monitors beeped in the background. “The fundamental problem with the quality of American medicine is that we’ve failed to view delivery of health care as a science. The tasks of medical science fall into three buckets. One is understanding disease biology. One is finding effective therapies. And one is insuring those therapies are delivered effectively. That third bucket has been almost totally ignored by research funders, government, and academia. It’s viewed as the art of medicine. That’s a mistake, a huge mistake. And from a taxpayer’s perspective it’s outrageous.” We have a thirty-billion-dollar-a-year National Institutes of Health, he pointed out, which has been a remarkable powerhouse of discovery. But we have no billion-dollar National Institute of Health Care Delivery studying how best to incorporate those discoveries into daily practice. I asked him how much it would cost for him to do for the whole country what he did for Michigan. About two million dollars, he said, maybe three, mostly for the technical work of signing up hospitals to participate state by state and coördinating a database to track the results. He’s already devised a plan to do it in all of Spain for less. “We could get I.C.U. checklists in use throughout the United States within two years, if the country wanted it,” he said. So far, it seems, we don’t. The United States could have been the first to adopt medical checklists nationwide, but, instead, Spain will beat us. “I at least hope we’re not the last,” Pronovost said. Recently, I spoke to Markus Thalmann, the cardiac surgeon on the team that saved the little Austrian girl who had drowned, and learned that a checklist had been crucial to her survival. Thalmann had worked for six years at the city hospital in Klagenfurt, the small provincial capital in south Austria where the girl was resuscitated. She was not the first person whom he and his colleagues had tried to revive from cardiac arrest after hypothermia and suffocation. They received between three and five such patients a year, he estimated, mostly avalanche victims (Klagenfurt is surrounded by the Alps), some of them drowning victims, and a few of them people attempting suicide by taking a drug overdose and then wandering out into the snowy forests to fall unconscious. For a long time, he said, no matter how hard the medical team tried, it had no survivors. Most of the victims had gone without a pulse and oxygen for too long by the time they were found. But some, he felt, still had a flicker of viability in them, and each time the team failed to sustain it. Speed was the chief difficulty. Success required having an array of equipment and people at the ready—helicopter-rescue personnel, trauma surgeons, an experienced cardiac anesthesiologist and surgeon, bioengineering support staff, operating and critical-care nurses, intensivists. Too often, someone or something was missing. So he and a couple of colleagues made and distributed a checklist. In cases like these, the checklist said, rescue teams were to tell the hospital to prepare for possible cardiac bypass and rewarming. They were to call, when possible, even before they arrived on the scene, as the preparation time could be significant. The hospital would then work down a list of people to be notified. They would have an operating room set up and standing by. The team had its first success with the checklist in place—the rescue of the three-year-old girl. Not long afterward, Thalmann left to take a job at a hospital in Vienna. The team, however, was able to make at least two other such rescues, he said. In one case, a man was found frozen and pulseless after a suicide attempt. In another, a mother and her sixteen-year-old daughter were in an accident that sent them and their car through a guardrail, over a cliff, and into a mountain river. The mother died on impact; the daughter was trapped as the car rapidly filled with icy water. She had been in cardiac and respiratory arrest for a prolonged period of time when the rescue team arrived. From that point onward, though, the system went like clockwork. By the time the rescue team got to her and began CPR, the hospital had been notified. The transport team got her there in minutes. The surgical team took her straight to the operating room and crashed her onto heart-lung bypass. One step went right after another. And, because of the speed with which they did, she had a chance.